Prince raced, under the name Pueblo Prince, ten times in his three-year-old year. Unfortunately, he never finished better than fourth, and earned a total of only $1,602. After that tenth race they gave up. 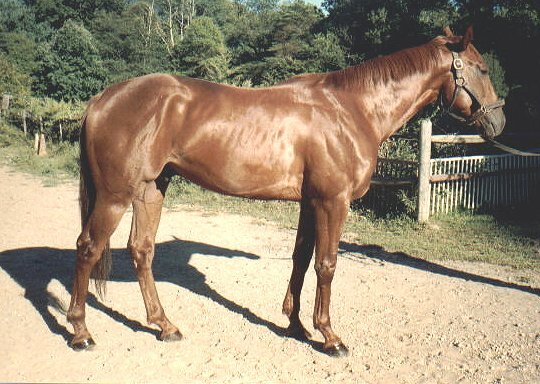 In September of 1991 they brought him to Norwood Farm, where his owner's riding horse was stabled, paid one month's board, and spread the word that the first $500 up the driveway would take him. Luckily, my friends Peter and Liz MacGillycuddy had a mare just a few stalls down the aisle, and they told me to go look at him. I didn't have to look very long. Two days later the owners and I shook hands on it, and on September 15 I brought him home to Tuckaway Farm, where I was the manager.